Networks consist of nodes and segments, they are used for roads, tracks, canals, walls, fences, powerlines etc. Networks are arguably the most complicated type of assets (depends on what you are creating) so this article assumes you are familiar with basic asset creation such as props and buildings, so it skips basic concepts such as what is a mesh, pivot etc. The template you choose will be fully imported as the starting point of your network, so choose one that is closest to your desired result. You can change almost everything later in the asset editor itself, or using ModTools scene explorer Ctrl+E or running scripts in the console F7. Depending on the AI of your network, it may have elevations such as Elevated, Bridge, Slope, Tunnel, which are their own complete networks with their own properties, lanes, segments, and nodes, which are bundled together with the Basic network inside the same .crp file. Elevations trigger at specific build heights, or when chosen by the player using Fine Road Tool. Slope is used for the basic to tunnel transition. If you don't need specific elevations, you can delete them by opening ModTools scene explorer Ctrl+E, going to Tool Controller > ToolController > m_editPrefabInfo > m_netAI and clicking Unset on the ones you don't need, then saving and loading the asset. If your template didn't have elevations, but you need them, you may be able to add them, depending on what AI your network has. This can be done by copying any other network into one of the possible elevations. You can find the base game networks in scene explorer Ctrl+E: Sunny (or North/Tropical/European/Winter, based on the theme environment you loaded for the asset editor) Collections > Road > NetCollection > m_prefabs. For example you could go to Basic Road > m_netAI, click Copy on m_bridgeInfo, and then go to Tool Controller > ToolController > m_editPrefabInfo > m_netAI and click Paste on m_bridgeInfo here, then save and load the asset. If you would like to copy a custom network into one of the elevations, you can also find those in scene explorer: Custom Prefabs > ModTools.CustomPrefabs > m_nets. The general properties are based on the AI the road has, that means for canals or cable car networks some of them might be different, this list is primarily based on the one for RoadBridgeAI, used for elevated networks of any normal road, but also contains properties which only appear on some other AI. This is used to determine how roads of different widths connect - nodes of narrow roads will widen to meet wider roads. Used to define the width of surface paint (such as pavement, gravel, or terrain clipping) but becomes very unreliable when lower than 4. It's also the width of the area affected by flatten terrain, drawable/selectable area and affects how the road will snap to the grid. Defines the width of the pavement on each side of the road, used to properly connect curbs with other roads at nodes. For correct nodes when intersecting with other roads, the half-width and pavement width values must be set appropriately. This needs to match the length of the mesh used for the segment (and node if used), otherwise, the road will overlap itself or have holes. Defines collision area for water and building other roads over/under it. Maximum slope angle allowed for building the road. Maximum angle allowed for intersecting the road. Limited to 135° by the game. Example of 90° (left) and 89° (right) max turn angle. When a node between 2 segments exceeds this angle, a node will be used, instead of a regular bent segment. Example of 0 (top) and 16 (bottom) min corner offset. Increases corner smoothing, this is more noticeable for sharp turns at low angles. High values will make the road hard to use in tight situations. When building the road, it will be created higher or lower than the player has chosen based on this value. 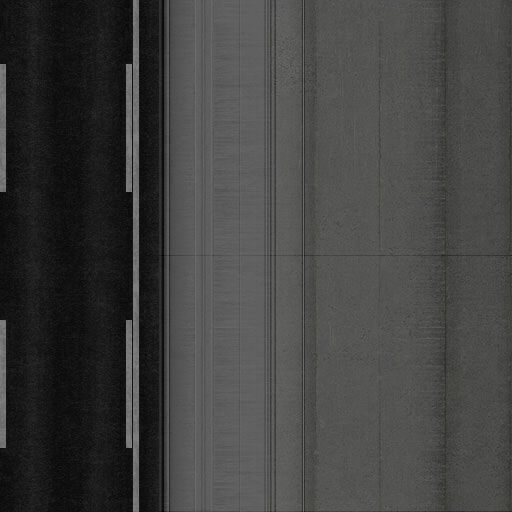 CO states this is the default height for vehicles and pedestrians, although it seems ingame the individual vertical offset for lanes is used instead. Applies surface paint based on the half-width of the road. 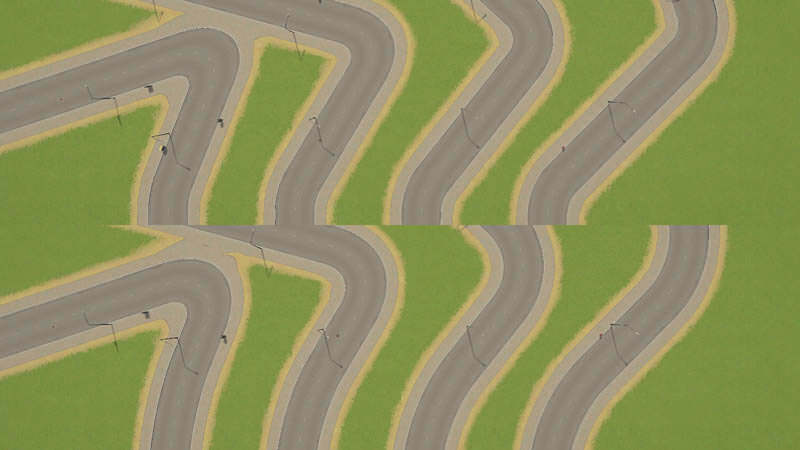 Flattens terrain based on the half-width of the road. Lowers terrain based on the half-width of the road. Usually used for elevated roads to prevent the terrain from clipping into them. Uses terrain clipping to create a hole in the ground, the actual hole is slightly smaller than the half-width, and it becomes very unreliable when half-width is less than 4. This also creates ruining around the hole. Places nodes according to terrain when building the road. Usually disabled for elevated or tunnel networks. Forces area around nodes to be completely flat. Note that the centers of intersections will be flat no matter what. Enables the use of bent nodes on intersections, used for most normal roads. If disabled and the network has no nodes, the segments will connect directly, which is used for wall networks, or with an offset based on min corner offset. Twists segment ends to align to the pillar, only used for power lines and cable car paths to make sure the wires connect to the pylon correctly. Tries to prevent the segment ends from bending/skewing at intersections. Automatically bends segments when building intersections at sharp angles. Use a bent segment instead of a node on sharp corners. Allows traffic to cross oncoming lanes at intersections, disabled only for roads with medians. Enables checking for collisions when building. Used for the dam, canals, flood wall, quay. Blocks water based on half-width and min/max height properties. Nodes of the current or other networks which match this connect group and have direct connect enabled will show up in intersections. For example - tram track nodes do this. Creates the zoning grid based on the road half-width, but no closer than 8m to the center. Used for the large highway bridges, alternates between two types of pillars and allows building longer segments than usual. Only works with disabled bending segments. Unknown, enabled for all elevated networks. Enables the traffic lights node flag for intersections involving the road. The actual traffic light props themselves must be added as lane props. Unknown, involved in code related to lane routing and simulation. Enabled only for all highways. Allows for the snow to accumulate on the road on winter maps. Used for canal depth (negative) and flood wall height. Allows embedding a building inside the network asset for use as a pillar which appears on nodes. Some AIs have specific pillars for different heights, corners, or intersections. Only used for Double Length networks, used for the large highway bridges for alternating pillars. Raises or lowers the pillars. Some properties are not visible in the road editor UI, but can be changed by using ModTools scene explorer Ctrl+E and going to Tool Controller > ToolController > m_editPrefabInfo. If this is disabled, every node will be an intersection. This is disabled for train or monorail station tracks so they always have the track cross node, and also for road slope(tunnel entrance) networks. Lanes are usually used for vehicles and pedestrians, but can also be used as a container for props. Some lane properties have no official documentation, therefore some explanations might be inaccurate. Distance from the center of the road. The width of the lane. The height position of the lane. Lane position offset used for pedestrian lanes with stop types, used for public transport stops such as bus and tram. 1.0 equals 50 km/h speed limit signs on vanilla. Usually 0.25 for pedestrian lanes, 0.8 for vehicle lanes on basic roads, 1 or 1.2 for larger roads, 2 for highways. Forward for right-hand lanes, backward for left-hand lanes. Automatically flips on left-hand traffic maps. Determines the kind of traffic the lane is meant for. If the lane type is set to vehicle, this defines which vehicle types can use the lane. Used for pedestrian lanes, on which people will wait for public transport. Used to find road access for buildings. Likely used for spawning or visiting vehicles. Usually disabled on any slope, elevated and bridge networks, also disabled on blimp, monorail, and cable car paths. Uses terrain instead of lane vertical offset or surface level. Used for ground pedestrian paths. Used for pedestrian lanes for tram stops in the middle of the avenue. Used for elevated pedestrian lanes which are not accessible from the regular roadside pedestrian lanes. Used only for the medium road monorail station stop lanes. 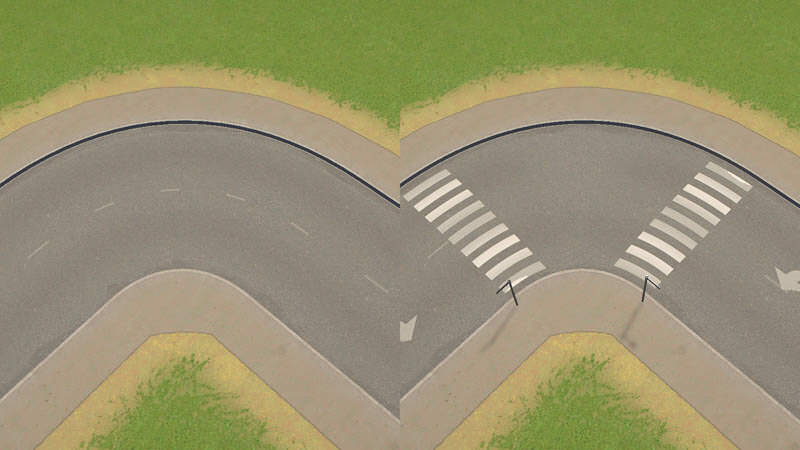 You can add props to lanes, such as hydrants, manholes, arrows, traffic lights, signs etc. except terrain conforming props such as fences. Lane props don't get embedded into the road asset .crp file, so you must add published workshop props. Required and forbidden conditions which determine when the prop will appear. Start and End flags refer to the direction of the lane, as it goes in one direction from start to end. Determines state of traffic lights and level crossing props. Prop XYZ offset relative to the lane position. When set to 0, repeats once per segment. Minimum segment length required for the prop to appear. 1 Means the prop will rotate to match the intersection if it's near it. The value 0.5 is used for traffic lights to not be perpendicular to the road at angled intersections. Percentage chance of the prop appearing. Segments can be the main mesh of your network, or also used for specific segments, like a bus stop on one side, bus stop on both sides. Required and forbidden conditions for each direction which determine when the segment will appear. Disables using the segment as a node on turns which exceed the Max Turn Angle. 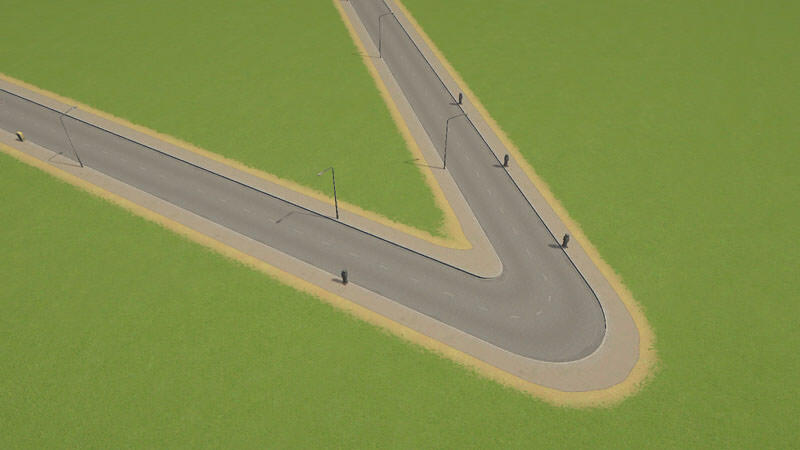 The upward road (asphalt) texture will get multiplied by this color. Used for ground-level roads. Instead of alpha being used for making the mesh transparent, it shows the underlying terrain such as grass or ruined. Will have weird normals/shading in many situations. Doesn't display normal maps. Used for elevated roads and bridges. Same as bridge but shows gravel instead of pavement. Used for power lines, tram wires, and cable car cables. Has specific mesh requirements. Conforms to terrain, used for Parklife fences. Can't be used for nodes. Can't be used in combination with segments/nodes which have other shaders. Lane props may not match the terrain conforming network depending on the AI and other settings. Nodes can be used for intersections, sharp turns, transitions, dead-ends. Required and forbidden conditions for each direction which determine when the node will appear. Limits the node to connect to networks which have this connect group. Works only when direct connect is enabled. Instead of splitting a node mesh in half and connecting each side separately, connects each segment in an intersection to every other segment. This is used for train tracks. There are many node, segment, and lane flags, and some of them might have different uses and results in different situations, so their descriptions might be incomplete or not relevant in all cases. Node flags are used to determine when certain nodes or lane props appear. Active for all created nodes. Active for nodes of networks which were on the map originally, not created by the user. Active for a dead end - where the road ends. Active for nodes between 2 segments of the same network. Active for nodes where an asymmetric network changes direction. Active for nodes which are intersections and transitions between 2 different networks. Active for nodes of networks which are placed within buildings, and therefore can't be deleted or upgraded under normal circumstances. Active for nodes which are at the edge of the map and connected to the "outside world". Active for the "middle" node of a double length network. For example - the node where the big pillar for highway suspension bridges is. Related to public transport line stops, unlikely to be related to normal networks created by the player directly. Active for nodes which are on the ground, as opposed to being part of an elevated, bridge, or tunnel network. Likely to be based on the AI of the network. Unknown. Likely to be related to automatically generated "transport lines" from the "outside world". Related to invisible networks such as pedestrian paths, ship dock or busway networks. Active for nodes of networks which are tunnels. Active for nodes between networks which have different "levels". For roads - dirt road is level 1 and the other roads have level 2 - 5 based on their UI category. Active for nodes which are train/road intersections. But also could be used for other things such as the canal lowered end node. Active for nodes which have literally only one way out - only one network with lanes which lead "out" from the current node. Active for nodes which have traffic lights. Active for nodes which have literally only one way in - only one network with lanes which lead "in" from the surrounding nodes. Related to power line networks. Unknown. Likely related to Natural Disasters DLC. Active for nodes where an asymmetric network changes direction from backward to forward, related to the direction in which the player draws the road. Active for nodes where an asymmetric network changes direction from forward to backward, related to the direction in which the player draws the road. Active for nodes for which the player has toggled traffic lights. Segment flags are used to determine when certain segments appear or how they appear. Active for all created segments. Active for segments of networks which were on the map originally, not created by the user. Active for every other segment of a continuously drawn network. Can be used to prevent the segment mesh from flipping every other segment. Active for segments of networks which are placed within buildings, and therefore can't be deleted or upgraded under normal circumstances. Used to display a bend segment mesh where a Bend node is. Related to transport lines and combustion engine ban district policy. Unlikely to be related to normal networks created by the player directly. Related to transport lines and pathfinding. Unlikely to be related to normal networks created by the player directly. Related to traffic light state. Also active for some "end" segments of networks using decoration wall AI. Related to traffic light state. Also active for some "end" segments of cable car networks, canals, or decoration walls. Active for segments with a bus stop on the right side based on the direction the road was built. Active for segments with a bus stop on the left side based on the direction the road was built. Active for segments with a tram stop on the right side based on the direction the road was built. Active for segments with a tram stop on the left side based on the direction the road was built. Active for segments inside a district which has the heavy traffic ban policy. Unknown. Likely related to traffic simulation when a building fire blocks nearby segments. Active for segments which are flooded with water. Active for segments inside a district which has the bike ban policy. Active for segments inside a district which has the old town policy. Used to display an asymmetric segment mesh where an AsymForward node is. Used to display an asymmetric segment mesh where an AsymBackward node is. Active for segments which have a custom street name assigned by the player. Active for segments which display the street name. Active for segments which have a player assigned stop sign at the start of the segment based on the direction it was built. Active for segments which have a player assigned stop sign at the end of the segment based on the direction it was built. Lane flags can be used to control when lane props are visible. Active for all lanes of created networks. Active for all lanes on left side traffic maps. Related to very short segments, with intersections on both sides. Used to hide traffic lights on such segments. Likely active for all "forward" lanes based on the direction the road was built. Used for arrow decal lane props. Likely active for lanes which continue to merge to a lower amount of lanes. Active for lanes which are bus stops. Active for lanes which are tram stops. Active for lanes of segments which have a player assigned stop sign at the start of the segment based on the direction it was built. Active for lanes of segments which have a player assigned stop sign at the end of the segment based on the direction it was built. Unknown. Related to surrounding one-way roads. Vanilla six-lane road segment mesh. The mesh for segments and nodes usually is an extruded profile, but some also have railings or other details. The mesh itself is usually 64 meters long, and it will always stretch for the entire segment, so it's not recommended to rely on the segment mesh for anything else other than the extruded profile, and use lane props for such details instead. The mesh is also subdivided multiple times, usually 16. The more subdivisions, the smoother it will look when bending. Node mesh also requires a cut through the middle, so the game can split it for use in intersections, it will also place the center vertex in the middle of the intersection. Normally you only have control over the horizontal (U) UV mapping (horizontal/vertical is called UV when talking about the texture image itself) because the game will automatically tile it along the segment depending on how long the segment is. You may have details for which you want to disable this automatic tiling, this can be done using vertex paint - by setting the green channel for those parts to 0, which means those parts would be 255,0,255 (magenta). 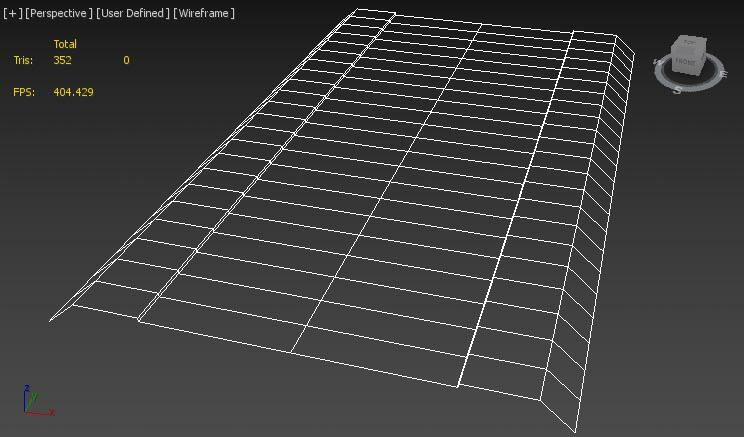 This will make sure the texture is exactly as you UV map it, so it will stretch together with the segment. You can use the Network Tiling mod to change how much the texture is tiled along the segments and nodes. The vanilla powerline wire mesh showing vertex paint and uv mapping. The wire shader requires a specific kind of mesh - each "wire" should be a vertical plane, which can be subdivided and curved like the vanilla powerlines. It should be UV Mapped horizontally from -1 to 1 but the height of the uv mapping depends on the height of the mesh, for example - on the vanilla powerline mesh each wire is 4m high, so the UV mapping vertically goes from -2 to 2. The vertex paint green channel must be 0. The blue channel controls the amount of sway in the wind, 0 means no sway. The red channel controls the phase of the sway. An example diffuse texture for an expressway. Just like any diffuse texture, defines the main color of the network. When black, on the basic shader, it displays the terrain underneath, on other shaders it works like an alpha map usually would. Black means invisible, white is visible. Defaults to white. Usually displays the map theme pavement texture, but for the rail shader - it shows gravel instead. Black means no pavement, white means pavement. Defaults to black, unless no diffuse is imported. Displays the map theme upward road (asphalt) texture, which also is multiplied by the segment color. Black means no asphalt, white means asphalt. Defaults to black. Works similarly to any other normal map. Doesn't require any inverted channels for parts which are vertex painted magenta, but it does require the green channel to be inverted for parts using the automatic tiling. Read more in the normal map article.